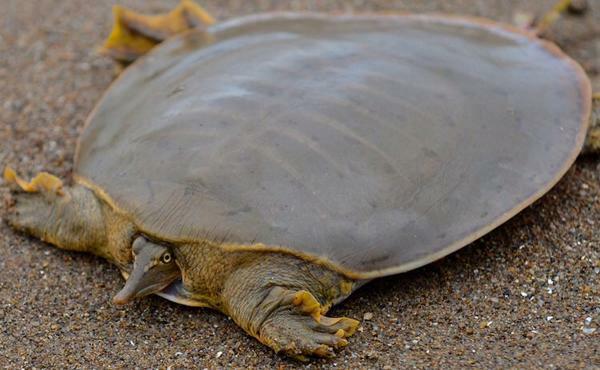 Today I want to write about an amazing looking animal, the frog-faced softshell turtle. Also known as Cantor’s giant softshell turtle, these guys grow up to 2 metres long, making them the largest softshell turtles in the world. They hide under the ground in the rivers where they live, with only their snout above ground. They attack very quickly, catching passing fish and crustaceans. They can hold their breath for a very long time, only coming to the surface twice a day to take a breath. At breeding time, the females lay 20-28 eggs in muddy riverbanks. Frog-faced softshell turtles can be found in slow-moving rivers and streams throughout southeast Asia, from India to southern China. However they are hunted throughout their range for their meat and are now considered endangered. Are there any other interesting facts that you would like to share about frog-faced softshell turtles?